Technology is at an interesting crossroads, where Linux rules the server landscape but Microsoft rules the enterprise desktop. Office 365, Skype for Business, Microsoft Teams, OneDrive, Outlook... the list goes on of Microsoft software and services that dominate the enterprise workspace. Microsoft's Office Communicator became Microsoft Lync which became what we know today as Skype for Business. There are pay software options for Linux that provide feature parity with Skype for Business, but Pidgin is a fully free and open source option licensed under the GNU GPL. Pidgin can be found in just about every Linux distro's repository, so getting your hands on it should not be a problem. The only Skype feature that won't work with Pidgin is screen sharing, and file sharing can be a bit hit or miss—but there are ways to work around it. You also need a SIPE plugin, as it's part of the secret sauce to make Pidgin work as a Skype for Business replacement. Please note that the sipe library has different names in different distros. For example, the library's name on System76's Pop_OS! is pidgin-sipe while in the Solus 3 repo it is simply sipe. With the prerequisites out of the way, you can begin configuring Pidgin. When firing up Pidgin for the first time, click on Add to add a new account. 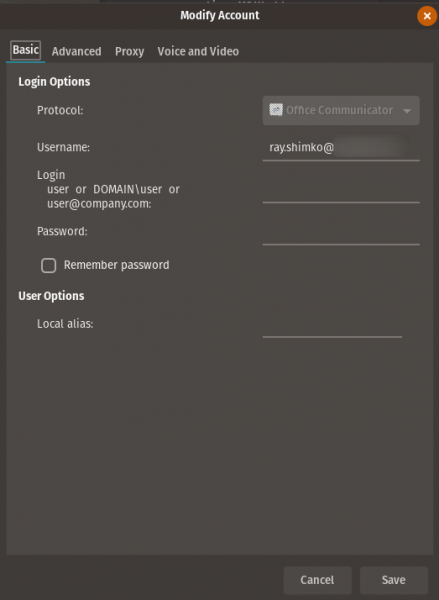 In the Basic tab (shown in the screenshot below), select Office Communicator in the Protocol drop-down, then type your business email address in the Username field. Next, click on the Advanced tab. 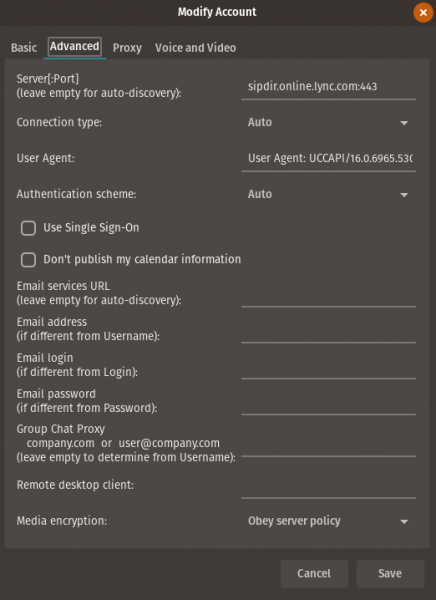 In the Server[:Port] field enter sipdir.online.lync.com:443 and in User Agent enter UCCAPI/16.0.6965.5308 OC/16.0.6965.2117. You shouldn't need to make any changes to the Proxy tab or the Voice and Video tab. 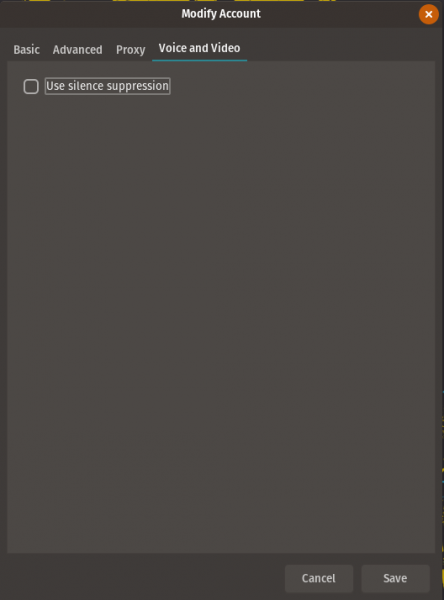 Just to be certain, make sure Proxy type is set to Use Global Proxy Settings and in the Voice and Video tab, the Use silence suppression checkbox is unchecked. After you've completed those configurations, click Add, and you'll be prompted for your email account's password. To add contacts to your buddy list, click on Manage Accounts in the Buddy Window. Hover over your account and select Contact Search to look up your colleagues. If you run into any problems when searching by first and last name, try searching with your colleague's full email address, and you should always get the right person. You are now up and running with a Skype for Business replacement that gives you about 98% of the functionality you need to banish the proprietary option from your desktop. Ray Shimko will be speaking about Linux in a Microsoft World at LinuxFest NW April 28-29. See program highlights or register to attend. Unfortunately the screen sharing is usually a big thing in large corporations. You can connect to a meeting and watch presentations through the Skype Web (requires some browser agent faking) but you can still not present anything yourself. That could have been solved when companies move from Skype for Business to Teams...well at least until Microsoft pulled the plug on accessing from Linux. Pidgin stores its passwords in plain-text, readable by any software on the host computer capable of accessing/reading files... Which is a HUGE security risk. Furthermore, Pidgin uses libpurple - which is renowned for its security flaws. If you have any concern for security at all, these issues make Pidgin a pretty bad choice... Think long and hard about whether you should use it. c) We report our security flaws as CVE's once they're fixed just like everyone else, if that's what you mean as "renowned for its security flaws"? In answer to (b), you have to remember that 99+% of your user base won't even realize how passwords are handled. Storing passwords in the clear should never be the default. I strongly recommend that you find a better solution. I have no problems from using Pidgin in the past to connect to other networks. Never tried the SIP stuff with it though. Once the disruptive Telegram app adds video calling (down the road), it's going to shake up the messenger space big time. I don't use Skype any more because I just don't trust Microsoft. Same thing with WhatsApp after the Facebook borg assimilated it. Telegram I trust completely. It's fast, efficient (not bloated like Skype! ), secure, looks great, runs on every platform (I'm looking at you, WhatsApp! ), and supremely innovative. It's best days are ahead of it once it launches its own crypto currency to be used among its 200+ million users - a huge potential marketplace of sophisticated users.